As soon as you open your 'baby blue eyes' every morning! "The Easy Part of Property Development is Spending Money" ... "Marketing Is What Gets It Back + A Bit More For Profit." So this topic is very important. People think Development Marketing is all about putting an advert in the paper, designing a brochure and following up the agents ... I don't think so folks!! Marketing starts before you buy the land. The location of the land impacts on marketing. Is it a desirable address? Is it in a prestigue location? What market sector of the buying public are you aiming for? Does the site have local prominence? Does the land have quality houses around it? All of these questions impact on your marketing plan, the home designs you select, the costings and untimate sales prices. So if marketing starts with the land selection, it logically goes on to the next design stage. Assuming you don't want to just copy something you've seen another has done, you need market knowledge. Marketing is no more than the presentation of your finished product to the buying public in the most favourable light, highlighting all the benefits your home has over the competition. One kind of marketing style that is a failure as far as I am concerned is the one that is based on the "Numbers Comparison." Our house has 5 of these, and 6 of those ... when that guy's house only has 4 of these and 3 of those. The potential buyer will eventually want to know these things, but "Right Now" they want to know "How They Feel" about living in the place, on your Road, in this neighborhood. Understand this: People SELL for Money ... People BUY with Emotion. If they don't feel good in your place, it does not matter if you give then 12 of these and 20 of those ... OK? I have always DEVELOPED and MARKETED on the basis of appealing to the human senses of See - Feel - Touch - Smell & Sound. I transfer all those into my design, because I am designing and building for 'Humans Beings' and human beings buy with emotions. So as a buyer, if a house looks good when I drive up to inspect it, I am favouable disposed to buy before I open the gate. When my feet touch the pathway/ entrance foyer and see the lovely landscaping my desire to buy is enhanced. As I enter the house and feel the ambience of the house envelop me I respond in a positive way if I feel emotionally comfortable in the space. When I smell all the new house smells, it translates into 'fresh' 'clean' 'new' and who doesn't like fresh new things. When I close the door of the house I enjoy hearing the sound of silence, which is conducive to rest and recuperation after a hard days work. Think about how you respond to each house you inspect as you go about gaining market knowledge. Do you see, it does not matter how many 'bibs & bobs' the place has ... if they don't feel emotionally comfortable in the place, they won't BUY! Can you see why this is my number one topic? So naturally I write about it a great deal in Residential Developmemnt Made Easy. So now you have some idea why marketing starts as soon as you open your 'baby blue eyes' every morning ... marketing is a direct reflection of who you are and how you expresss yourself in creating beautiful livable space FOR HUMAN BEINGS. The 'by-product' happens to be 'money.' And if you do it very well, it happens to be 'Lots of Money. ClickBank accepts Visa, Mastercard, American Express, Discover, Eurocard, Bravo, Visa Debit, Mastercard Debit, or Novus. Customers in the US can also pay by online check. 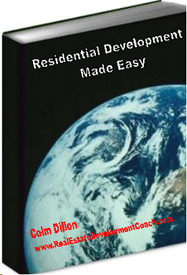 Buy "Residential Development Made Easy"